Stars: John Krasinski, Emily Blunt, Millicent Simmonds, Noah Jupe, Cade Woodward. In a quiet place, no one can hear you scream? A well-made, tense and suspenseful horror film from director John Krasinski (best known for his work on the US version of tv sitcom The Office), A Quiet Place is also as scary as hell. Not since last year’s Don’t Breathe has the use of silence been such an effective and potent cinematic tool for creating edge of the seat tension and a palpable sense of dread. A Quiet Place doesn’t waste any time on backstory here; instead it throws us straight into a post-apocalyptic world when much of humanity has been decimated by an alien invasion of some sort. A title card informs us that we are in Day 89. It is a world lying in ruins, and where silence is an important key to survival. There are corn fields and silos everywhere, but the main street stores are deserted and empty and survivors are scarce. We meet the Abbott family as they forage through a deserted department store looking for medical supplies. They communicate largely via sign language and hand signals. Father Lee (Krasinski himself) and his wife Evelyn (played by Krasinski’s real life wife Emily Blunt, from Edge Of Tomorrow, etc) creep silently through the store with their three children – Marcus (Noah Jupe, from Wonder, etc), Regan (hearing impaired actress Millicent Simmonds, from Wonderstruck), and Beau (Cade Woodward). This world is a dangerous place in which any sound can lead to tragedy, as is superbly realised when Beau fires up a battery-operated toy spaceship and is quickly killed by one of the alien creatures. The film then moves ahead another year, and the Abbotts have turned their farmhouse in upstate New York into a fortress with lots of soundproofing to ensure that they can live in relative peace. The Abbott’s daily life on the farm is a dangerous proposition as routine tasks such as eating, doing the laundry, playing board games and hunting for food carry enormous risks. But there are few options. But Evelyn is now heavily pregnant, which will certainly lead to complications as the creatures seem drawn to their property. The Abbotts quietly go about preparing their underground bunker in which they will raise the baby. But you clearly sense that something bad is about to happen. We only get a fleeting glimpse of the creature early on, which builds up a sense of dread. Later, we get to see the carnivorous creatures in more detail – they are truly nasty looking; they have legs like an insect and a body and head that looks vaguely like something out of the Alien franchise; they are also blind but have a well-developed sense of hearing that allows them to hunt their prey. 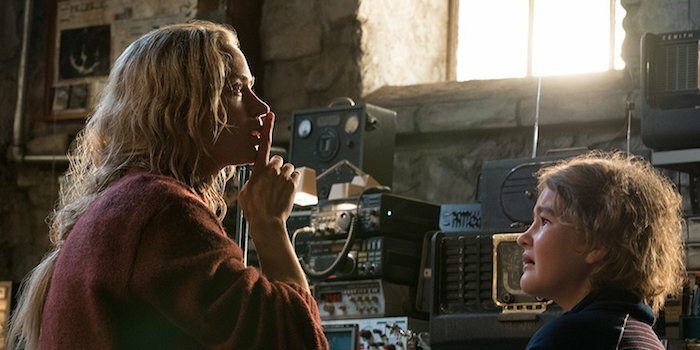 A Quiet Place is the third feature directed by Krasinski (after Brief Interviews With Hideous Men and The Hollars) and is easily his most assured and polished effort to date. This is his first foray into the horror genre but he incorporates some well-placed jump scares. He handles the material with restraint, and deftly builds up the claustrophobic suspense and ratchets up the sense of impending dread. The visual effects that create the creature are excellent and seamlessly incorporated into the live action. Written by Krasinski, working from a script by Bryan Woods and Scott Beck (The Bride Wore Blood, etc), the film explores the importance of communication in holding a family together, the nature of sacrifice, parental responsibility. With its story about a tight knit survivalist family trying to face up to some mysterious creature, the film also recalls the creepy It Comes At Night, which also featured a small cast and minimal CGI effects. There is little in the way of dialogue here, which somehow underscores the dangers of the situation. Krasinski instead relies heavily on visual storytelling and images to convey the sense of the narrative. There is some effective sound design from Erik Audahl (Transformers: The Last Knight, etc), Brandon Jarvis (13 Hours, etc) and Michael Barosky (The Forgotten, etc) which creates plenty of tension. It’s somewhat ironic to see a film produced by Michael Bay that dials the sound down to minimal! Marco Beltrami’s sparse score is also effective in heightening that mood of uneasiness, and the moody cinematography from Danish cinematographer Charlotte Bruus Christensen also further enhances the unsettling tone and atmosphere. Krasinski draws great performances from his small ensemble cast who have to convey emotions and ideas largely though facial expressions and gestures. This is a physical and emotionally demanding role for Blunt, and she brings emotional depth and a sense of real fear to her performance as Evelyn. This is a change of pace for Krasinski, better known for his comedic roles, but he is good as a man desperately trying to hold his family together. Simmonds’ soundless performance is perfect, and she brings a sense of guilt and a feisty quality to her role. But her authenticity is also the glue that holds the film together. And young Jupe continues to build on his impressive performances in Suburbicon and Wonder with another strong, nuanced performance that stamps him as an actor with a big future. Leave your popcorn and other noisy distractions at the door for this one!